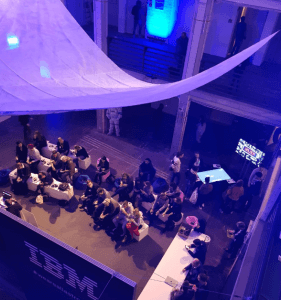 At the Data Natives Conference in Berlin for three days it was all about data, technologies and innovation: 4 stages, more than 100 speakers and around 1,600 visitors. This year etventure was also part of the event, represented by Principal Marc Weimer-Hablitzel. In his speech “Big Data is dead” he explained how companies can generate real added value from their data. 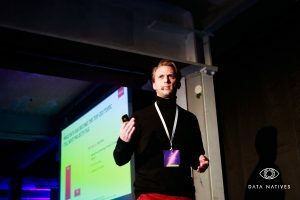 The method of data thinking therefore uses a new approach: The first step is to find out in which use cases there is the greatest potential, then to prove this potential and only then – but then consistently – to design the data generation. “In order to really benefit from machine learning and AI, you must not limit your design to the data you currently have, but must orient yourself to what you optimally need. This is the basis for your data strategy,” says Marc Weimer-Hablitzel. Data Thinking combines Data Science with the proven innovation method Design Thinking to a holistic approach. First, suitable use cases with high, measurable business impact are identified. It is important not only to look at the existing data, but also to consider which data is really needed. By the continuous check of pre-defined hypotheses, deficiencies in assumptions or the data landscape are identified at an early stage. The focus is always on the user’s perspective – entirely in line with the Design Thinking approach. It is ultimately the user who decides whether a project is successful or not. Breakthrough, data-driven use cases trigger a rethink within the organization. Thinking continuously with data enables enterprise-wide digital transformation. Data Natives is first and foremost a community that has emerged from a series of local events in 48 major technology centers around the world. Every year in November, the Data Natives Conference is the culmination of this technology movement. Since then, Data Natives has evolved into a meeting point for a global community of data-driven pioneers to discuss the technologies and trends that shape both the business world and our individual lives – from artificial intelligence to blockchain to health tech. This year, too, it was not just about input and knowledge transfer. The participants also had the opportunity to acquire concrete know-how in various workshops, for example on the subject of chatbots and how to deal with GDPR.